Last year when I showed you how I used neutral density filters for fireworks and daytime subjects, I mentioned I could not wait to try them on waterfalls in the Spring. I took a trip down to Taughannock Falls State Park last weekend and brought the Dolica CF-NDK77 77mm 0.3, 0.6, 0.9ND Neutral Density Filter Kit with me. To show you the difference a Neutral Density filter can make. Here is a photo of the 215 feet (66 meters) waterfall using a hand-held shutter speed of 1/30th of a second. Taughannock Falls State Park near Ithaca, New York without a Neutral Density filter. Nikon D700/28-300VR, 1/30s, f/16, ISO 800, EV -0.3, 28mm focal length. You can see a lot of definition in the moving water of both the falls and the creek even at a hand-held slow shutter speed. Notice the difference of the waterfall when I use a 3-stop (0.9) Neutral Density filter which required the use of a tripod as the shutter speed dropped to 4 seconds. 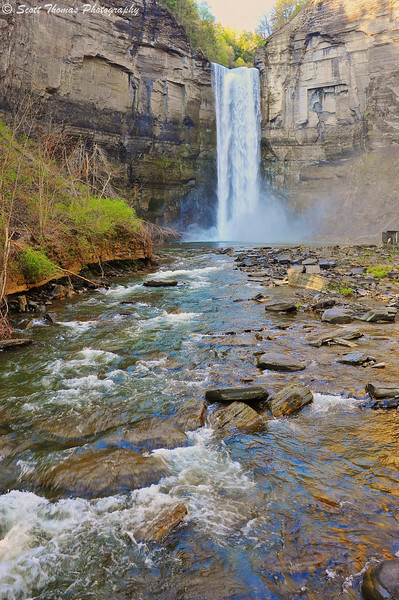 Taughannock Falls State Park near Ithaca, New York using a 3-stop (0.9) Neutral Density filter. Nikon D700/28-300VR, 4s, f/16, ISO 200, EV -0.3, 28mm focal length, 0.9 ND filter, tripod. The waterfall has the sliky look people love with the added shutter speed time and the neutral density filter keeps the image from being overexposed. BONUS: I am still getting used to the fact I now carry a video camera with me at all times. The iPhone 4 takes HD video and easily uploads it to youTube. Now, I just have to remember to use it in Landscape mode. 🙂 Enjoy! This entry was posted in Nature, Photography and tagged 28-300mm, creek, dolica, filter, geology, gorge, iphone 4, ithaca, long exposure, neutral density, new york, nikon D700, rocks, spring, state park, stream, taughannock falls, tripod, video, vr, water, waterfall, youtube. Bookmark the permalink. Personally, I LOVE my 10 stop ND filter – SO much fun. The first photo was taken on a wooden pedestrian bridge and there were too many people walking over it for a long exposure this time. It is on my future shot list! Very nice demonstration! Both shots are nice. Spoken like a true photographer. However, most people prefer the look of the water in the second photo. I’m fascinated by the comparison too. I’m no kind of photographer at all, but I never let that stop me from having opinions . . . 🙂 I prefer the first image because I like “being there” and because I have very definite ideas about water. The second image is very pretty, and would be the better choice for a lot of uses. It strikes me that the technique might be an interesting way to look at fire. It’s good to have the full range of possibilities in your toolbox. The waterfall looks like a stream of frozen milk. Will have to try that, YB. Thanks for the idea. I like the first photo best because the you can see the photo more as you would if you were actually standing there, the second photo is more dramatic, but to my mind a little less “real”. Cool to compare and contrast though. People who photograph, tend to like the more natural photos of waterfalls. Others like the surreal of the long exposure look. It still amazes me that a filter can change a shutter speed like that. Nice demo. And thanks for the reminder on the video – it is on my iPod touch too! Filters let us be creative just as using different lenses allow us to be. Very cool, Scott. I want one of these for an entirely different reason. I want to set up a tripod outside of a busy spot downtown, like Union Station, and take shots of people rushing to/from work. Shooting a moving escalator loaded with people might also be interesting. I need a person to stand in the crowd perfectly still, for effect. Hmmm…I bet you could find some mannequins around store escalators. You could be the person in your own compositions. Use a long shutter speed and your camera’s timer to trip the shutter. The filters I use are a pretty good bargain. Very cool, now I want one. Great comparison – Thanks! No problem, Deanna…just click the link! I can’t believe it’s that much of a difference. I like both images, and if I really have to choose then I like the first image best. Interesting. Could some of you show this post to your non-photographic friends and family and see which one they like? This is kind of like HDR images. Many photographers do not like them while the general public goes nuts over them. Never leave home without it, wonderful posts and info Scott, beautiful images as well ! !